The comic is brilliant in its ability to explore what is precious about the perspective of a child. The art style points out the amazing beauty of the everyday scenery we take for granted. And the artistic depiction of Calvin's imagination shows the bubbling possibilities that lie under the surface of appearance. 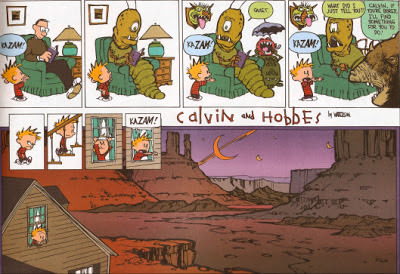 In the comic, there is a blurry line between the real world and Calvin's imagination. His vivid visualizations of outer space adventures, dinosaurs, and film noir detectives show how integrated the fantastic and the real are to a child's eyes. Calvin's great and often hilariously tragic pursuit is the enjoyment of the moment. This often leads to Calvin getting into trouble. But we find it hard to fault him for his lack of responsibility when we share in the marvellousness of his experience. Who has time to do homework when aliens are invading? What's housework compared to a brilliant vista of snow to play in? Calvin helps grownup readers stop taking themselves and the world they've constructed so seriously. Helps grownups examine how much beauty and marvelling they preserve in their experience. Anyone who has spent time with children knows that they can be very funny without meaning to, simply because they are so earnest in voicing their perspective. 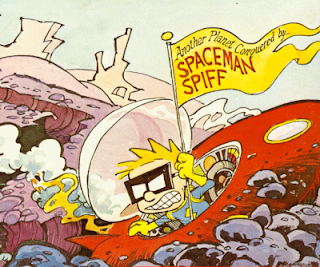 Calvin and Hobbes uses this device to great effect when the two friends discuss issues of deep philosophical importance. When Hobbes ask Calvin whether he believes there is a God, Calvin thinks about it before finally replying, "Well, somebody's out to get me." We laugh at Calvin's naivete... but also at how often we discover ourselves to be equally naive. There are very few sure things in Calvin's world, in this lies both its beauty and its irresponsibility. 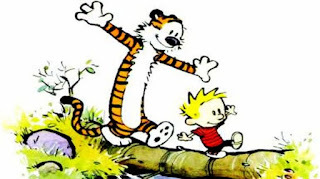 But what redeems Calvin is the absolute value he places on friendship. No matter what strangeness is experienced, he experiences it together with his friend. Their friendship is an anchor of unconditional love on a sea of changing meaning. I read Calvin and Hobbes while I was growing up and it was a useful guide to me which helped me navigate the uncertainties of being a kid. What I am realizing these days is that the comic still functions as a useful guide: for how to navigate the uncertainties of being a grown-up. The preciousness of the present moment with its funny and tragic beauty is worth pursuing. 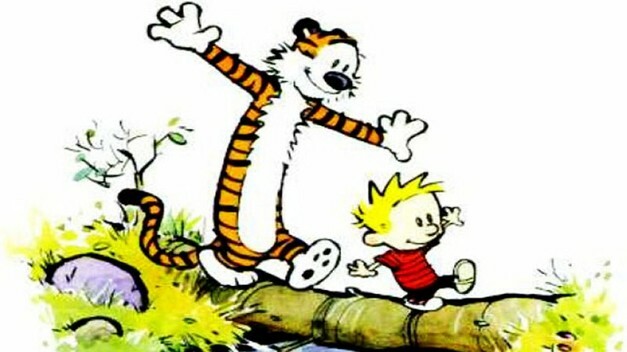 And Calvin and Hobbes show us how to embrace that experience without taking ourselves too seriously as we go. So if you haven't read it, go read it. If you have read it, go read it again!